The 2010 Nominating Committee chose the new members of the committee at its recent business meeting, held during the 2011 Annual Conference in New York in February. The Board of Directors also appointed three liaisons. CAA publishes a call for nominations and self-nominations for Nominating Committee service in CAA News and on the website in late fall of every year. CAA seeks nominations and self-nominations for scholars with a specialization in non-Western subject matter to serve on the jury for the Millard Meiss Publication Fund for a four-year term, July 1, 2011–June 30, 2015. Candidates must be actively publishing scholars with demonstrated seniority and achievement; institutional affiliation is not required. The Meiss jury awards grants that subsidize the publication of book-length scholarly manuscripts in the history of art and related subjects. Members review manuscripts and grant applications twice a year and meet in New York in the spring and fall to select the awardees. CAA reimburses jury members for travel and lodging expenses in accordance with its travel policy. Candidates must be current CAA members and should not be serving on another CAA editorial board or committee. Jury members may not themselves apply for a grant in this program during their term of service. Nominators should ascertain their nominee’s willingness to serve before submitting a name; self-nominations are also welcome. Please send a letter describing your interest in and qualifications for appointment, a CV, and contact information to: Millard Meiss Publication Fund Jury, College Art Association, 275 Seventh Avenue, 18th Floor, New York, NY 10001; or send all materials as email attachments to Alex Gershuny, CAA editorial associate. Deadline: April 22, 2011. The deadline for CAA members to apply for two important positions in the publications program—reviews editor of The Art Bulletin and editor-in-chief of Art Journal—is Friday, March 25, 2011. 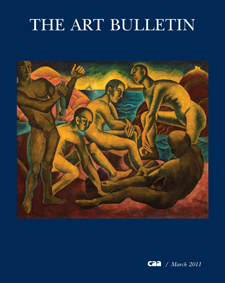 The Art Bulletin Editorial Board invites nominations and self-nominations for the position of reviews editor for a three-year term: July 1, 2012–June 30, 2015, with service as incoming reviews editor–designate in 2011–12. Candidates should be art scholars with stature in the field and experience in editing book and/or exhibition reviews; institutional affiliation is not required. They should also be published authors of at least one book. The reviews editor is responsible for commissioning all book and exhibition reviews in The Art Bulletin. He or she selects books and exhibitions for review, commissions reviewers, and determines the appropriate length and character of reviews. The reviews editor also works with authors and CAA’s codirectors of publications in the development and preparation of review manuscripts for publication. He or she is expected to keep abreast of newly published and important books and recent exhibitions in art history, criticism, theory, visual studies, and museum publishing. This three-year term includes membership on the journal’s editorial board. The reviews editor attends the three annual meetings of the Art Bulletin Editorial Board—held twice in New York in the spring and fall and once at the CAA Annual Conference in February—and submits an annual report to CAA’s Publications Committee. CAA reimburses the reviews editor for travel and lodging expenses for the two New York meetings in accordance with its travel policy, but he or she pays these expenses to attend the conference. Candidates must be current CAA members and should not be serving on the editorial board of a competitive journal or on another CAA editorial board or committee. Members may not publish their own work in the journal during the term of service. Nominators should ascertain their nominee’s willingness to serve before submitting a name; self-nominations are also welcome. Please send a statement describing your interest in and qualifications for appointment, a CV, and at least one letter of recommendation to: Art Bulletin Reviews Editor Search, College Art Association, 275 Seventh Avenue, 18th Floor, New York, NY 10001; or email the documents to Alex Gershuny, CAA editorial associate. Deadline: March 25, 2011; finalists will be interviewed on Friday, April 29, 2011, in New York. 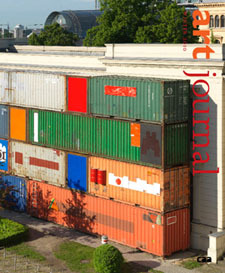 CAA invites nominations and self-nominations for the next editor-in-chief of Art Journal, to serve a three-year term: July 1, 2012–June 30, 2015, with service on the Art Journal Editorial Board in 2011–12 as editor designate and in 2015–16 as past editor. A candidate may be an artist, art historian, art critic, art educator, curator, or other art professional; institutional affiliation is not required. Working with the editorial board, the editor-in-chief is responsible for the content and character of the journal. He or she solicits content, reads all submitted manuscripts, sends submissions to peer reviewers, and provides guidance to authors concerning the form and content of submissions. The editor-in-chief also develops projects, makes final decisions regarding content, and may support fundraising efforts on the journal’s behalf. He or she works closely with CAA’s staff in New York. The editor-in-chief attends the three annual meetings of the Art Journal Editorial Board—held twice in New York in the spring and fall and once at the Annual Conference in February—and submits an annual report to CAA’s Publications Committee. CAA reimburses the editor for travel and lodging expenses for the two New York meetings in accordance with its travel policy, but the editor pays his or her own expenses for the Annual Conference. The position usually requires one-half of a person’s working time. CAA provides financial compensation for course release, usually to an editor’s employer. Candidates must be current CAA members and should not be serving on the editorial board of a competitive journal or on another CAA editorial board or committee. Nominators should ascertain their nominee’s willingness to serve before submitting a name; self-nominations are also welcome. Please send a statement describing your interest in and qualifications for appointment, a CV, and at least one letter of recommendation to: Art Journal Editor-in-Chief Search, College Art Association, 275 Seventh Avenue, 18th Floor, New York, NY 10001; or email the documents to Alex Gershuny, CAA editorial associate. Deadline: March 25, 2011; finalists will be interviewed on Thursday, April 28, 2011, in New York. The official Google Book Settlement website recently posted an update that extends the deadline to file for an upfront payment in the Google Book Search Copyright Class Action Settlement. Authors whose works were scanned by Google on or before May 5, 2009, may be entitled to claim a cash payment once the amended settlement is approved. The former deadline was March 31, 2011. The new deadline is one year after the approval of the settlement—a date yet to be determined. The lawsuit, titled Authors Guild, Inc., et al. v. Google Inc. (Case No. 05 CV 8136, S.D.N.Y. ), was brought by authors and lawyers who claim that by scanning books still under copyright for the Google Books Library Project, Google violated the creators’ rights. The federal court originally approved a settlement to the lawsuit in November 2008, and then preliminarily approved an amended settlement in November 2009. A second class-action suit for copyright infringement was brought against Google in April 2010 by visual artists excluded as plaintiffs in the first suit, including the American Society of Media Photographers, several other photography associations, the Graphic Artists Guild, and independent photographers and illustrators. The outcome of this case (No. 10 CV 2977, S.D.N.Y.) will be determined after the settlement of the first case. What does the extended deadline mean for authors and publishers? According to the Google Book Settlement website, if “you did not previously opt out of the Original Settlement and do not opt out of the Amended Settlement, you are ‘in’ the Amended Settlement,” and you can claim your copyrighted material. The website contains all documents related to the settlement and forms and instructions for registering your work. The Authors Guild also publishes updates about the settlement. CAA will publish an additional notice once the new deadline is established. CAA invites nominations and self-nominations for individuals to serve on ten of the twelve juries for the annual Awards for Distinction for three years (2011–14). Terms begin in May 2011; award years are 2012–14. CAA’s twelve awards honor artists, art historians, authors, curators, critics, and teachers whose accomplishments transcend their individual disciplines and contribute to the profession as a whole and to the world at large. Candidates must possess expertise appropriate to the jury’s work and be current CAA members. They should not be serving on another CAA committee or editorial board. CAA’s president and vice president for committees appoint jury members for service. No jury members are needed this year for the Art Journal Award and the CAA/Heritage Preservation Award. Nominations and self-nominations should include a brief statement (no more than 150 words) outlining the individual’s qualifications and experience and an abbreviated CV (no more than two pages). Please send all materials by email to Lauren Stark, CAA manager of programs; submissions must be sent as Microsoft Word attachments. Deadline: April 15, 2011. At its February 2011 meeting, the CAA Board of Directors approved applications from four organizations to become affiliated societies, which are groups of art professionals and other organizations whose goals are generally consonant with those of CAA, with a view toward facilitating intercommunication and mutual enrichment. Established in 2010, Art, Literature, and Music in Symbolism and Decadence (ALMSD) focuses on European culture from the late nineteenth to early twentieth century. Working to demonstrate the philosophical connection between arts in different countries that were affected by Symbolist ideas, the organization facilitates the exchange of ideas among scholars through an annual newsletter and a conference held every four years at the Allerton Park and Retreat Center in Monticello, Illinois, or at other international locations. The Asian American Women Artists Association (AAWAA), founded in 1989, is dedicated to the visibility and documentation of Asian American women in the arts. Through exhibitions, publications, and educational programs, the organization offers thought-provoking perspectives that challenge societal assumptions and promote dialogue. AAWAA activities include a resource portal; regular lectures in art, ethnic, and Asian American studies classes; thought-provoking exhibitions, panel discussions, literary readings, and workshops; and books and catalogues on Asian American women artists. A new organization established last year by Independent Curators International, the Curator’s Network brings together curators from around the world who want to share their work and exchange information with other professionals in the field. Among the sponsored activities are an online Curator’s Index; a forum for members to share information, called the Network Directory; and Dispatch, a bimonthly newsletter. More than one hundred curators have joined the network. Founded in 2000, the National Alliance of Artists from Historically Black Colleges and Universities (NAAHBCU) brings art and art education to the forefront of member institutions. It also provides comprehensive activities that offer opportunities for professional artists employed at member institutions. In addition, NAAHBCU highlights the artistic achievements of artists through exhibitions; provides scholarships for promising art majors; meets annually to confront issues that affect art departments at historically black colleges and universities; shares information on current technology, art history, and art trends; and disseminates employment opportunities. CAA’s Directory of Affiliated Societies is currently accepting updates. If you are an officer or the official CAA contact for an organization, please send an updated text, in the same format as your current listing, to Lauren Stark, CAA manager of programs, either as a Word attachment or pasted in the body of an email. The CAA Board of Directors held its first meeting of the year in New York on Sunday, February 13, 2011. Twenty-four board members attended in person at the Hilton New York in midtown Manhattan. The board welcomed its first appointed director, Anne-Imelda Radice, a senior consultant for the Dilenschneider Group who has a strong record of public service. The director of the Institute of Museum and Library Services from 2006 to 2010, she also served in the National Endowment for the Humanities and the National Endowment for the Arts and worked as a museum curator and director. Radice earned a PhD in art and architectural history from the University of North Carolina, Chapel Hill. Rick Asher, president of the National Committee for the History of Art (NCHA), summarized the relationships among his organization, CAA, and the Comité International d’Histoire de l’Art (CIHA). For example, NCHA includes two CAA representatives on its board—currently Nicola Courtright and Paul Jaskot, both past CAA board presidents. Asher reminded the CAA board about the upcoming CIHA conference, to be held in Nuremberg, Germany, in July 2012. He also expressed a desire to foster more regional participation and will look to CAA for assistance in the future. Barbara Nesin, CAA president, and Linda Downs, CAA executive director, thanked the board and staff for an outstanding Annual Conference and Centennial Kickoff. Drawing a record seven thousand attendees this year, the conference presented new approaches to sessions, such as bringing together leaders in the field for the Centennial Sessions, and the use of new technologies. Nesin and Downs commended the Services to Artists Committee for outstanding programming in ARTspace. The newly elected board members were announced: Leslie Bellavance, Alfred University; Denise Mullen, Oregon College of Art and Craft; Saul L. Ostrow, Cleveland Institute of Art; and Georgia K. Strange, University of Georgia. These four will begin their four-year terms at the next board meeting in May 2011. Nesin thanked five directors who will rotate off the board at the end of April for their dedicated service: Sue Gollifer, University of Brighton; Ken Gonzales-Day, Scripps College; Andrea Kirsh, independent scholar and curator; Amy Ingrid Schlegel, Tufts University; and William E. Wallace, Washington University in St. Louis. The entire board joined Nesin in extending a heartfelt appreciation for the dedication of Paul Jaskot of DePaul University, who joined the board in 2004 and served as president from 2008 to 2010. In the past eighteen months, CAA has made progress on accomplishing a third of the tasks described in the 2010–2015 Strategic Plan, particularly in communications, membership, and Centennial publications. Andrea Kirsh, vice president for external affairs, reported on an increase in student and artist members and thanked the board for its involvement in solicitations for the Centennial Campaign. Maria Ann Conelli, vice president for committees, presented the annual review of CAA’s Professional Interest, Standards, and Practices Committees. She commended the Committee on Women in the Arts, the Education Committee, the Museum Committee, the Professional Practices Committee, the Services to Artists Committee, and the Student and Emerging Professionals Committee for their outstanding work this year. Michael Fahlund, deputy director, announced the recipients of the 2010–11 Professional Development Fellowships: Alma Leiva, Virginia Commonwealth University; Sheryl Oring, University of California, San Diego; Brittany Ransom, University of Illinois, Chicago; Mina T. Son, Stanford University; and Amanda Valdez, Hunter College, City University of New York. Fahlund also discussed the recently launched podcasts series on career-development topics. Sue Gollifer, vice president for Annual Conference, confirmed the record attendance of seven thousand attendees and applauded the great success of the Centennial Sessions. She also thanked Jean Miller, a fellow board member, for helping her organize the first Strategic Plan Focus Group Discussion, which was devoted to technology and communications. Anne Collins Goodyear, vice president for publications, presented the Resolution and Recommendations on Editorial Safeguards and Procedures, which represented the results of an eighteen-month review of CAA publications and research into similar scholarly publishers. After a thorough analysis of the editorial practices of The Art Bulletin, Art Journal, and caa.reviews, the task force concluded that CAA is among the leaders in addressing safeguards and editorial practices. The Recommendation on Editorial Safeguards and Procedures will soon be published on the CAA website. Officer elections were held, and the following members will begin their one-year terms in May: Patricia McDonnell, vice president for external affairs; Maria Ann Conneli, vice president for committees; Anne Collins Goodyear, vice president for Annual Conference; Randall Griffin, vice president for publications; and DeWitt Godfrey, secretary. In addition, three board members have been elected to the 2011 Nominating Committee: Jay Coogan, Jacqueline Francis, and Patricia Matthews. The board approved applications from four organizations to become CAA affiliated societies: Art, Literature, and Music in Symbolism and Decadence (ALMSD); the Asian American Women Artists Association (AAWAA); the Curator’s Network at Independent Curators International; and the National Alliance of Artists from Historically Black Colleges and Universities (NAAHBCU). The board welcomes your thoughts on the above issues and more in preparation of its next full-day meeting, scheduled for Sunday, May 1, 2011. Send your ideas and suggestions to Vanessa Jalet, CAA executive assistant. You may also read about the previous board meeting, held in October 2010. Last week, CAA sent an email blast to 2011 Annual Conference attendees, asking for feedback on all aspects of last month’s event. Please complete the survey, which has several fields for open-ended answers, by Friday, March 25, 2011. The survey asks you to identify yourself (e.g., artist, art historian, or student) and your type of affiliation and then to rate your experiences with various conference events and services—from online registration and the conference hotels to session content and Career Services activities. If you attended the Book and Trade Fair or used your conference badge for free museum admission, let CAA know. The survey also asks your thoughts about the conference website and how CAA can better deliver conference information. 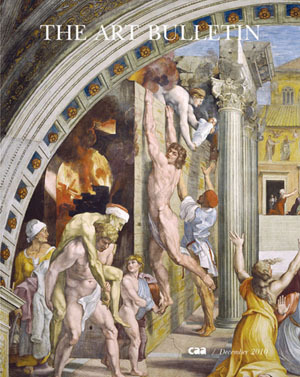 Articles in the March 2011 issue of The Art Bulletin, the leading publication of international art-historical scholarship, examine a range of topics that include the Bocca della Verità in Rome and German painting and Czech Cubism. Two additional essays and a collection of important book reviews round out the issue, which has been mailed to all individual CAA members who elect to receive the journal, and to all institutional members. In “The Mouth of Truth and Forum Boarium,” Fabio Barry evaluates the Bocca della Verità in Rome from numerous perspectives to recover its origin as an antique drain cover in the form of the god Oceanus, relating the Bocca to the myth of the Romanized Hercules from the reign of Hadrian. Moving to modern times, Eleanor Moseman uses the case study of Ernst Ludwig Kirchner and Bohumil Kubiša to explore the relation of German painting and Czech Cubism, revealing “style” as a central issue in the international dialogue of the visual arts of early-twentieth-century Central Europe. Two essays focus on historical Chinese art and culture. In “The Buddha’s Finger Bones at Famensi and the Art of Chinese Esoteric Buddhism,” Robert H. Sharf argues that the “finger bone” relics of the Buddha, discovered in 1987 in a crypt beneath the Famensi (Dharma Gate Monastery) in Shaanxi Province, China, could be considered as “art.” For her contribution, Jeehee Hong examines the peddler as a skeletal puppeteer in Li Song’s thirteenth-century painting, The Skeletons’ Illusory Performance, to unveil a midimperial Chinese visual commentary on the relations among performance, the everyday world, and death. In the Reviews section, Robert S. Nelson surveys several books on art, architecture, and urbanism in the Turkish capital from the fifteenth to the twentieth century, including Shirine Hamadeh’s The City’s Pleasures: Istanbul in the Eighteenth Century and Murat Gül’s The Emergence of Modern Istanbul. Stephen J. Campbell examines the understudied field of Renaissance portrait medals through a recent book and a two-volume catalogue, while Sheila S. Blair and Jonathan M. Bloom consider the implications of Finbarr Barry Flood’s Objects of Translation: Material Culture and Medieval “Hindu-Muslim” Encounter, a book about the material culture of the region from western Afghanistan to northern India from the eighth to the thirteenth century. Last, Kirk Ambrose reviews the English translation of Friedrich Kittler’s Optical Media: Berlin Lectures 1999, a theoretical study of visuality and technology that considers such topics as Renaissance perspective, photography, film, and television, and the computer. Please read the full table of contents for more details. The next issue, to be published in June 2011, will feature essays on Pieter Bruegel the Elder, Jean-Honoré Fragonard, Edgar Degas, and Philip Guston.